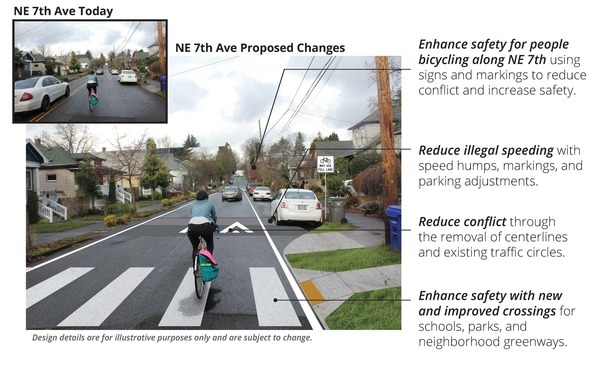 The decision to build a bikeway on NE Ninth Avenue and establish the Safer 7th project came about after additional public outreach and focus groups. This outreach found that the major changes needed to make a bikeway on NE Seventh Avenue did not have broad public support. This two-project solution incorporates the safety and access needs expressed by all neighbors. In 2015, Portland City Council unanimously adopted Portland’s Racial Equity Goals and Strategies which directs city services to “strengthen outreach, public engagement, and access to city services for communities of color and immigrant and refugee communities, and support or change existing services using racial equity best practices” among its equity goals. Since then, PBOT has focused its efforts on broader public involvement and engagement. As the Lloyd to Woodlawn project team began sharing design options with the neighborhood, it became clear that Black community organizations in the neighborhood were concerned about how traffic diversion on NE Seventh Avenue would impact their access to the multiple Black community institutions on the street and the people they serve. At an open house in August 2018, many community members expressed that the proposed street designs would impact their traffic patterns without increasing their travel options. As a result, PBOT held two focus groups and had a series of conversations with community leaders about the travel needs of people who have historically been served by those institutions. Having heard these concerns, PBOT revised its designs to ensure the project provided better connections and access for all neighborhood stakeholders. The final projects on NE Ninth and NE Seventh avenues reflect the feedback the bureau received. Both the NE Ninth Avenue bikeway and Safer 7th will reduce conflict between people, improve safety for everyone, and establish a low-stress pedestrian and biking route connecting the neighborhoods of Woodlawn, Vernon, Sabin, King, and Irvington to both the Lloyd District and the new Sullivan’s Crossing bridge over I-84, coming in 2020. On NE Ninth Avenue, PBOT will make crossing busy streets safer for pedestrians and people biking, including crossings that are part of PBOT’s Safe Routes to School program connecting to King and Irvington Elementary Schools. 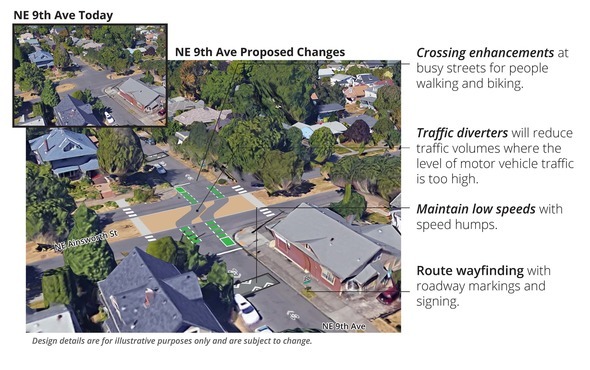 Traffic diverters are proposed where NE Ninth Avenue crosses Ainsworth, Emerson, and Webster streets, reducing the volume of motor vehicles where the volume exceeds city standards for neighborhood bikeways, known as greenways. Users will be able to travel through Irving Park as they travel north and south through the area. An improved route through Irving Park is currently not surveyed, designed or funded. When we have that capacity, PBOT and Portland Parks and Recreation will seek funding for a route that will provide an improved connection through the park. The Safer 7th project will reduce conflict and improve safety along NE Seventh Avenue, particularly in areas where people walk and play along the corridor. PBOT will install new speed bumps and paint new street markings to reduce speeding. We’ll remove existing traffic circles to reduce conflict between people. And we'll build safer crossings along popular school and pedestrian routes. In addition, the bureau will improve where NE Seventh Avenue crosses Going, Morris, and Tillamook streets, connecting these neighborhood greenways with signs, street markings, and by adjusting the location of stop signs. Furthermore, a bike lane on NE Seventh Avenue from Tillamook to Weidler streets will create a complete connection to the Sullivan’s Crossing, a new bridge over I-84, coming in 2020. "NECN sincerely appreciates and supports PBOT's effort to have authentic outreach and engagement with diverse stakeholders regarding the Safer 7th project," said Adam Lyons, Executive Director of the Northeast Coalition of Neighborhoods. “PBOT was proactive in getting the feedback of our community. They listened to the good, the bad and the ugly… but most importantly they just LISTENED. We appreciate that our feedback was heard and are hopeful it will be used throughout the implementation,” said Anthony Deloney, Director of Strategic Initiatives at Self Enhancement, Inc.
With the neighborhood greenway route decided, PBOT will now move forward with the design and engineering for both NE Seventh and NE Ninth avenues. Construction for both projects is currently estimated to begin in Spring 2020. The Lloyd to Woodlawn Greenway is expected to cost $552,000 for design, engineering and partial implementation. Funding is provided through PBOT’s Fixing Our Streets. Fixing Our Streets is the result of the passage of Measure 26-173, a 10-cent gas tax and Portland’s first local funding source dedicated to street repair and traffic safety projects citywide. Fixing Our Streets helps PBOT do preventive street maintenance that saves money and prevents potholes. It also supports the bureau’s work to make it safer for children to walk to school and allows the bureau to build more sidewalks, traffic signals, streetlights and bike lanes. The bureau is currently working to identify funding for the remaining elements of each project. PBOT is committed to increasing diversity, advancing equity and fostering inclusion in everything that we do. PBOT’s Equity and Inclusion Program will continue to deepen the engagement of racially diverse populations that have been historically underserved by the bureau. These efforts include the expansion of community partnerships, resources for community-led ideas and building more internal capacity to implement racial equity, disability and language access initiatives. In 2019 PBOT will be working to establish a transportation equity framework to further clarify the bureau's racial equity commitments, goals and intended outcomes. Learn more about PBOT current equity and inclusion initiatives here and sign up for updates from PBOT’s Equity and Inclusion Program here.